Although Betsson aren't currently offering any bonuses they do offer one of the best experiences. Anyone who browses to their site will see why, with a slick web 2.0 design - it's a breeze to use and quite refreshing from a bookmaker. 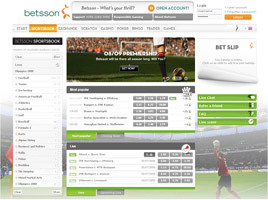 Betsson was founded in 2001 and their website was launched in May 2002. Within a month, the Exchange element had been added to the site and the further options have been developing ever since. Available in a large range of languages, Betsson is a truly global site and one that has had a lot of time and effort placed into its look and style. In comparison to sites like Bet365 or Betfred, the style of Betsson has definitely had a large element of design consideration placed into it. The graphics and characters available in the Poker and Casino sections are extremely watchable and add an extra element to these options. The site does use many modern looking designs and features and it may be a bit bewildering for new users on first glance. There is a lot of information and visuals on every page which may be distracting but once you get past that, the site improves quickly. Each click loads up new details and options and it becomes easy to move about the site quickly. After a few hours on site, it will become second nature to move about and select your betting slips. A handy counter on the Sportsbook page will quickly inform you of how many available markets there at that point in time. When we checked there were over 4,500 markets to bet on although 4,100 were related to football bets. For a firm that has a global reach there wasn’t the save variety of options that other sites have but there was a broad range of sports available. The football options are extremely comprehensive and if you ever wanted to bet on the Slovakian League or the second tier of Japans J-League then Betsson is the site for you. The Exchange section builds on the Sportsbook and provides the same style of options from the familiar bet exchange websites available. With Scratchcards, Casino, Poker, Bingo, Games and trader options, there is a huge amount of gambling options offered by Betsson. There is nothing on the site to indicate that new members are given any offers or incentives to gamble with Betsson. That’s not to say the site never provides offers for new customers but at the time of review, there was nothing to indicate this. Betsson offer a points service and each time a you bet with real money, you are rewarded with points. Saving up these points can enable the member to exchange this for real money, in an almost cash back like situation. Aside from this, there are not a lot of additional features provided by Betsson and the firm appears content to compete on good prices and stylish design as opposed to additional content or options.